We’ve received a lot of great feedback on the Summer issue White Sand Massage and Day Spa feature story. I’m glad that our readers enjoyed learning about facials as much as I enjoyed getting one. This issue I sat down over a couple of beers with local artist “Indian” Dennis to talk about his popular painted cow skulls. 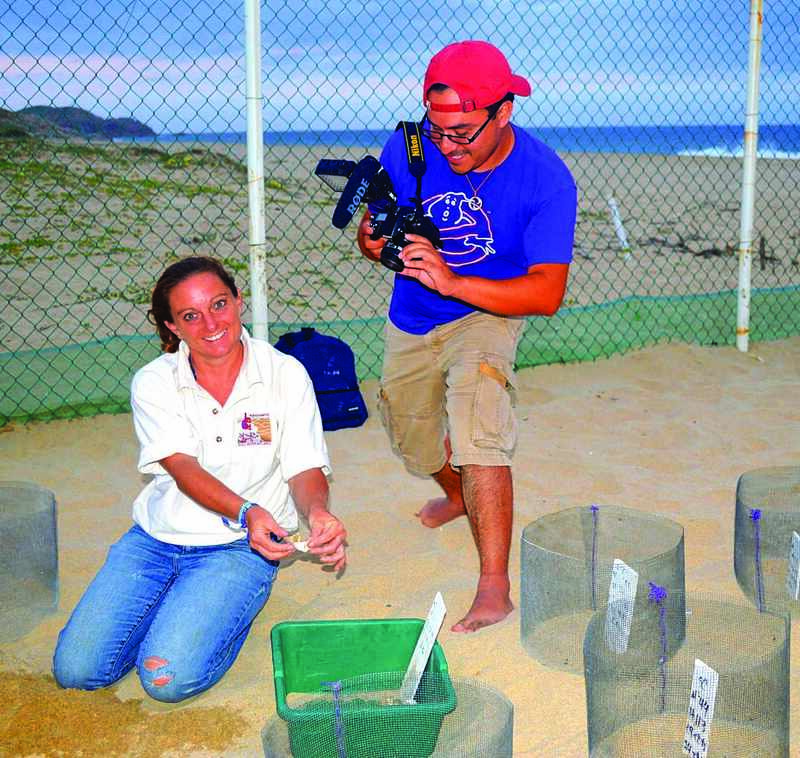 This fall I also had the opportunity to spend a night at “sea turtle camp” with Todos Santos Eco Adventures and their wildlife biologist Stephanie Rousso, who wrote “Moon Dance of a Sea Turtle” (JDP Summer 2013 issue). Reading Rainbow producer Kyle Rohrbach was along filming the night patrol for an upcoming episode. We had a lot of fun, learned a lot and saved four Olive Ridley turtle nests. I hope to share more of my adventures with our readers in upcoming issues. 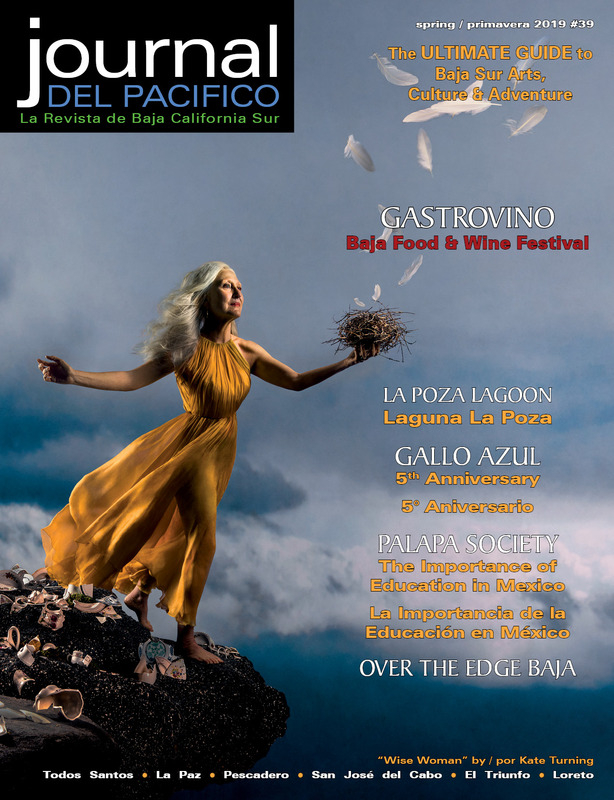 In this edition, look for our feature story on water—an important issue for all of us living in Baja California Sur. Local artist Nanette Hayles’ “Sea un Avatar” posters benefit the groups working against mining in the Sierra de la Laguna mountains (the source of our water) and are available at Galería NE Hayles and La Esquina in Todos Santos. 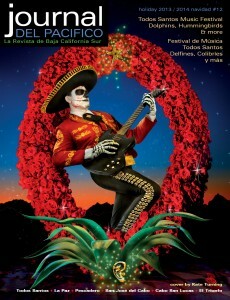 We’ve also included a sampling of fun restaurants in Todos Santos. For the complete series of reviews, visit Todos Santos Eco Adventures’ blog. H2O Water Professionals sell and install state of the art water purification and conditioning systems for homes and businesses. Visit their showroom on Calle Madero in La Paz, or contact their Todos Santos / Pescadero representative. Rancho la Venta is one of the oldest ranch sites in Southern Baja, located in a greenbelt between San Bartolo and San Antonio. You can enjoy horseback riding, hiking and bird watching on hundreds of acres of mountain trails, swim in their spring-fed granite pool, and lunch on authentic ranch fare including organic veggies from the garden. 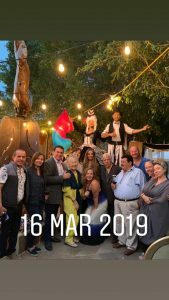 Touring the wine cellar, vineyard and art studio makes a great day trip, or stay overnight in one of their cozy casitas if you’d like to experience it all. Many of Journal del Pacifico’s contributors have books coming out soon. Photographer Claude Vogel’s new collection of stunning photographs from the Hotel California is due out in November. Also in November look for Pamela Cobb’s Tales from Tiny Town, a compilation of her experiences since retiring to Todos Santos and illustrated by local artists. Photographer Kaia Thomson has shared some photos from her 12 years of birding in Baja California Sur on this issue’s cover and in our feature “Birding in Baja.” Her book Birding in Baja California Sur, published by Todos Santos Eco Adventures and produced by Journal del Pacifico, will be out soon! Just behind El Tecolote Bookstore you can find the best handmade chocolates in Todos Santos at Chocolates La Laguna. This year they will also have full-size chocolate bars, including dark chocolate/peppermint, dark chocolate/orange and 66% Mexico Origin dark chocolate. 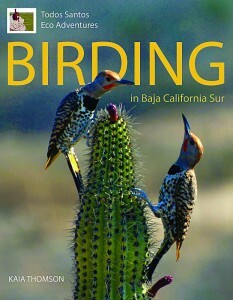 Jackie Scherer and Keith Van Cleve have published the 4th edition of Some Birds of Baja / Algunas Aves de Baja California (see article in JDP Spring 2012 #4 issue). 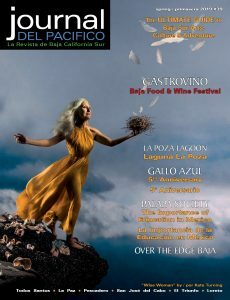 This book is for sale at the San José Organic Farmer’s Market and at Liga MAC bookstore in San Jose del Cabo. The improvement project in the “pueblo nuevo” part of Todos Santos has been completed and all the newly paved streets are one way streets now. We’ve highlighted all the one ways in yellow on our Todos Santos map with arrows showing the correct driving direction. Rancho Pescadero is open again after their summer remodeling. November 14 through 17, they are hosting “The Best of Baja Culinary Weekend.” A “mix + mingle” with Baja’s top chefs and renowned winemaker, Phil Gregory of Vena Cava. 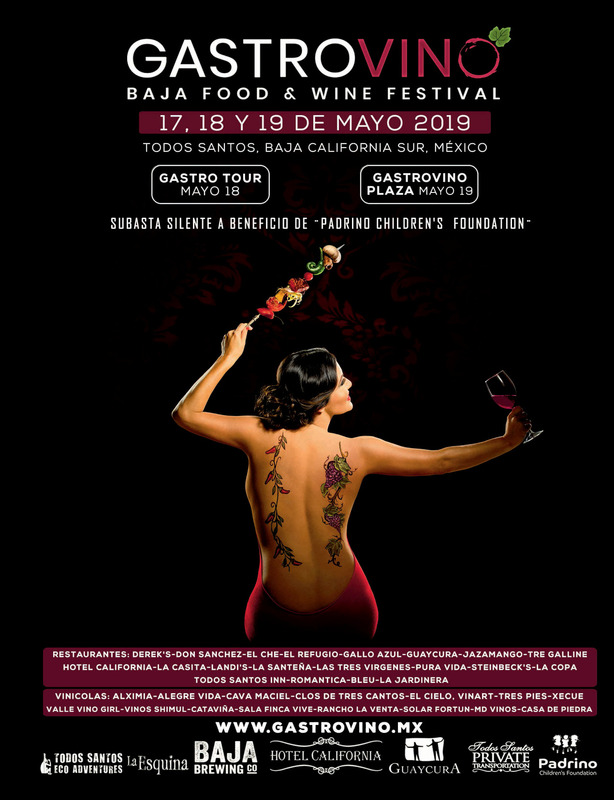 Activities include cocktails and cooking classes, demonstrations, wine and tequila tastings and, of course, gourmet dinners. Hotel Guaycura was also busy remodeling this fall. 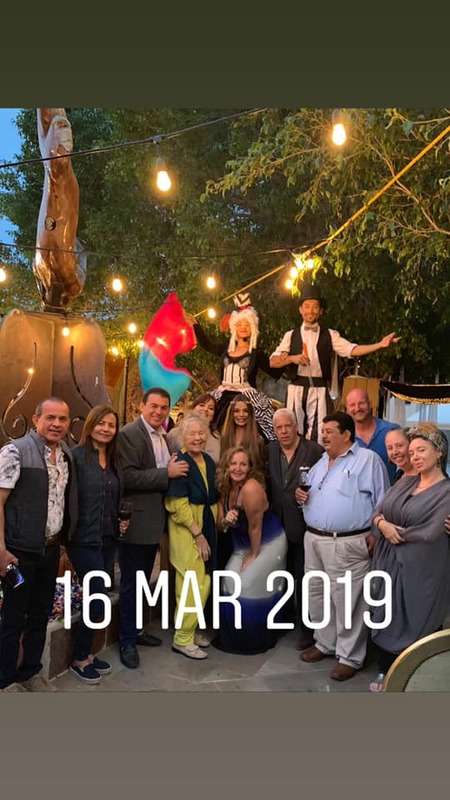 Their beautiful boutique hotel, restaurant, pool and sky bar are open again in the historic district of Todos Santos. All that is missing is you! Insurance agent Gaby Trujillo Coronado has opened a new office on the “otro lado” of Todos Santos, called Coronado & Fernandez. They can help you with your auto, home, health and life insurance needs. AF Design & Construction will be sharing the new office space. Baja Zen yoga studio is now open near Los Cerritos beach. They have morning and evening yoga classes and many interesting workshops scheduled for the upcoming season. Visit their facebook page for details and a map to their location. Brody’s Pizza, on the road to Cerritos beach, will be serving breakfast in addition to their tasty pizzas this season. Look for them to re-open in November. Baja Retreats is a new retreat center in Pescadero. Yoga, art, surf, meditation, skim board, nature… Vacation with Inspiration! Call or visit their website for information. 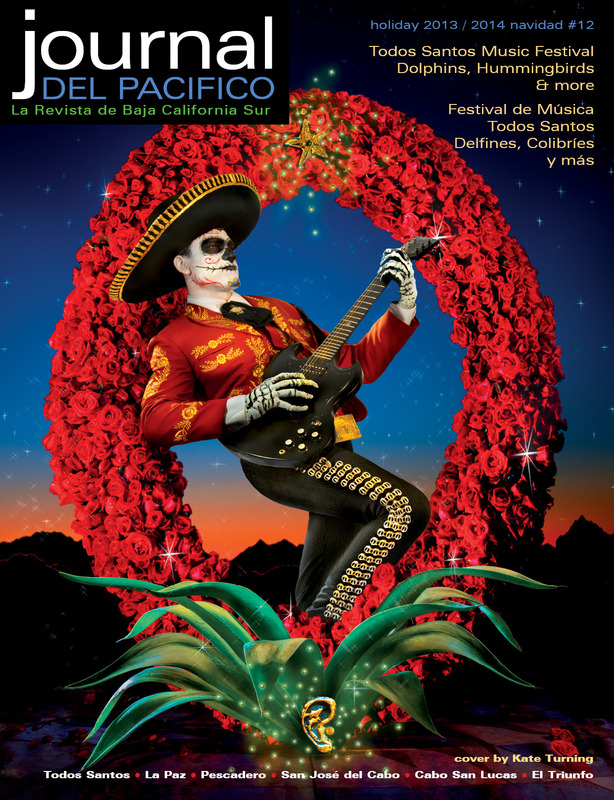 The third Todos Santos Music Festival will take place at the Hotel California January 16 through 25, 2014. For more information, see our blog post and be sure to check out our great feature in the next issue of the JDP about the bands and festival.